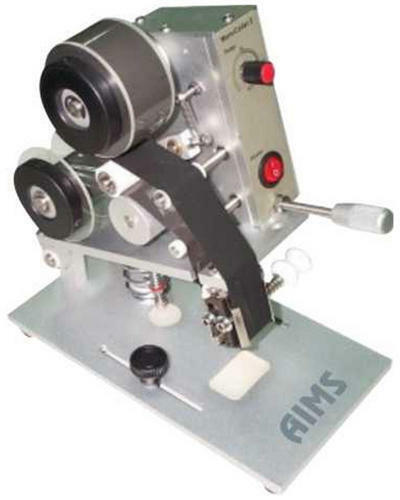 Manual Hot Foil CoderModel HFC - 30 - M for manual printing of B.No., Mfg.Dt., Exp.Dt., M.R.P. `, etc. using imported foil ribbon heated Brass type stereos. The 3 to 4 line message (of 13 character in each line) to be printed is easily composed by pushing the Brass Stereos into the grooves tightening them for speeds upto 40 impressions per minute. The inking is in the form of Foil ribbon, which passes below the stereos is advanced automatically after each print. The brass stereos are heated to a temperature of around 150 deg. C hit the film onto the substrate thus transferring the print with embossing which has no drying time and is better quality than pre-printed quality. (Free accessories include 2 mm Numeric Brass Character Set Hot Foil Ribbon). This Coder is suitable for high quality manual printing on pouches, cartons, etc. 3 lines of 13 char.